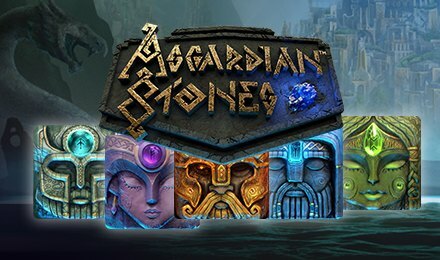 Themed on Norse mythology, Asgardian Stones slot, is the latest top-notch creation of NetEnt. As you launch this game, you will be visiting the Greek Mount Olympus through the magnificent backdrop. You will find yourself amidst colossal stones which can make your luck shine! While this game is activated, the various symbols you will see on the reels are Wild, Ace, King, Queen and four Norse Gods. Instead of rolling on the reels, these symbols will fall downwards from the reels, and will disappear, to let other symbols appear. On this game, the avalanche feature is used to form winning combinations. . . which means that you have more potential chances of winning! There’s an auto-play option on this game and it can be activated anytime. By activating this feature, you can pre-select a number of games to be played on their own, without any disruptions. Amount of Paylines Selection: The 20 paylines are fixed throughout the gameplay. Coin Values: The stakes range from £0.20 to £200.00, and you can choose your preferred stake by toggling the plus or minus tabs. NetEnt have added few rewarding and amazing features on this slot game. Trust your luck and you might discover all the features! After one avalanche has been completed, the colossal crush feature is activated. There will be one colossal symbol which will fall onto the reels, and it will crush any symbols in its passage. Then, you will be awarded 1x multiplier for every symbol which has been crushed. You can win up to a maximum of 4x multipliers. This feature can be activated after a first avalanche, during any rounds. A colossal symbol will fall and crush all symbols below it, until it reaches the bottom of the reels. And, each time a symbol is crushed, a multiplier is awarded. You can win up to 4x multipliers. The Bonus Wheel Feature is represented as a 3x3 symbol and it appears only on the three last reels. Once all the winning combinations have been taken off the reels, the bonus wheel will start spinning. You can win either free spins or coin prizes. The Free Spins Round can be awarded depending on the outcome of the Bonus Wheel. You can receive 5 to 15 free spins, depending on where the bonus wheel stops. During the free spins, you can see multipliers or colossal wilds on the reels.